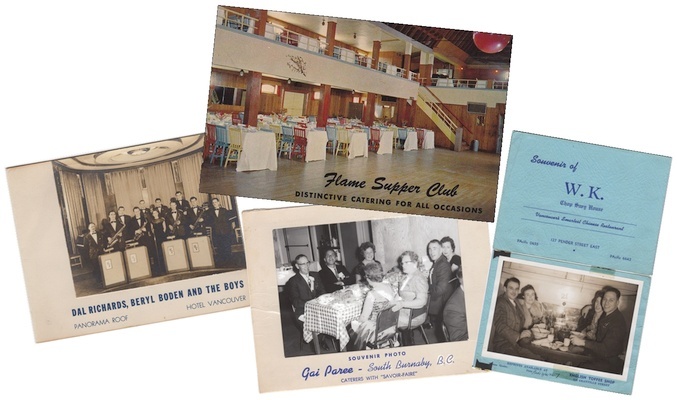 The next Vancouver Postcard Club meeting will be Sunday, March 12, 2017 doors open at 11:30 am for trading, with presentation beginning after our meeting at noon, wrapping up by 2 pm. Our speaker will be club member Maurice Guibord, who will give a presentation on Vancouver Night Clubs in the Board Room of the Hastings Community Centre. Maurice is always an entertaining speaker, and more than ever, the subject of Vancouver’s legacy of night clubs is a source of great fascination and lore. If you are too young to remember venues like the Cave, the Flame, and the Gai Paree, you simply must attend! Also note that Daylight Saving begins in the early morning hours of March 12, so please set your clocks forward Saturday night. Remember the old saying: “Spring forward, fall back”! All interested in postcards and local history are welcome to attend.